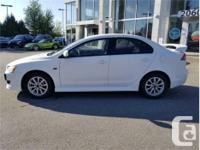 2012 Mitsubishi Lancer SE WHITE in IMMACULATE condition! CALL ALEX @ for Manager's Special Internet Pricing! 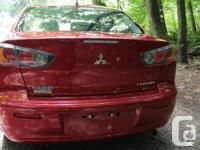 2012 Mitsubishi LANCER SE, Mint condition! Certified! 25,296 kms! Completed safety inspection, lube oil & filter change! Tons of features, heated seats, bluetooth 2.0, USB, A/C, power windows, 7 airbags, 4-disc brakes, ABS, EBD, and much much more! Amazing factory warranties! 10 Year/160,000 kms Powertrain Warranty, 5 Year/100,000 kms comprehensive Warranty, 5 Year/Unlimited roadside Assistance! Book a test drive today! ------------- Why buy from us? We are a family owned and operated business, with an A+ BBB rating for over 27 years by successfully selling great cars at great prices! Metro Town Mitsubishi Certified Pre Owned, 5965 Kingsway and Imperial (49th), DL#7672. All prices plus applicable fees ($598) and taxes.